Every month one of our employees here at Designers Only will pick their current "favorite" in the showroom. Whether its a piece of furniture, a new line of fabric, or a funky rug, you'll get to see what our staff is currently admiring. Renaissance period in Italy with its emphasis on symmetry and proportions. architectural plans, classical columns and friezes, statuaries, inlay work and tile design. 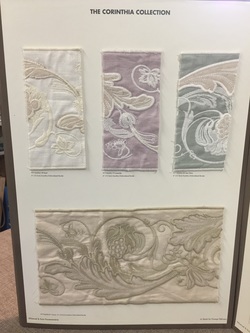 exclusive collection of exquisite, embroidered linen and wool appliqué borders. This is my favorite for the month because these tapes are so beautiful and they come in a few different sizes. You have the option to do 5" tape or 2.75" tape.